(Newser) – You'll never guess why "Firehole Lake Drive" is temporarily off-limits to tourists in Yellowstone National Park. 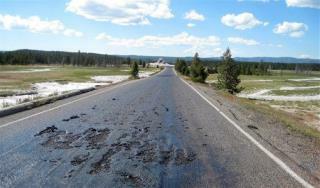 Yes, the popular 3.3-mile loop is closed for a while because the asphalt is melting, reports National Parks Traveler. "Extreme heat from surrounding thermal areas has caused thick oil to bubble to the surface, damaging the blacktop and creating unsafe driving conditions," says a park release. While that kind of thing isn't uncommon given Yellowstone's geology, the damage to the road is "unusually severe," reports the AP. I know the heat is from within the Earth's crust / core, but some liberal moron will either try to blame it on carbon emissions, global warming, or.... George Bush. Can't I please blame it on the use of fossil fuel? Oh No! 2012 maybe coming true with that SUPER VOLCANO In Yellowstone? The Myans maybe a little off on the date? Hmmmmm... There ya go!